The visits can be fraught. “Sometimes people say: ‘The Germans have all our heritage! 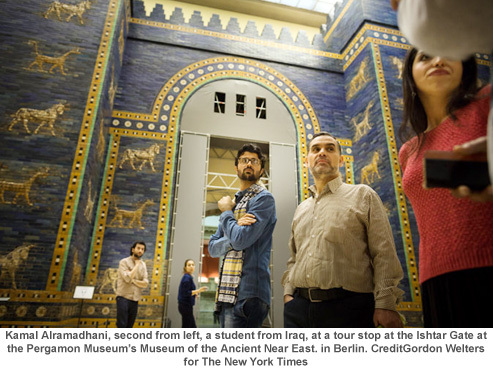 They stole it!’” said Zoya Masoud, 27, who led the Arabic-language tour that afternoon at the Museum of Islamic Art, which is part of the Pergamon Museum and filled with treasures from empires past. Often, the visitors say the art is probably better off in Berlin because so much in Syria has been destroyed by the war and the Islamic State, Ms. Masoud said. 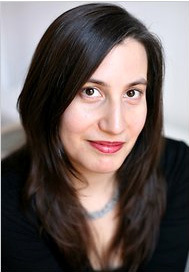 Ms. Masoud is not a refugee — she grew up in Damascus, a child of Syrian and Lebanese parents, and moved to Europe to study in 2010, before Syria fell into civil war. 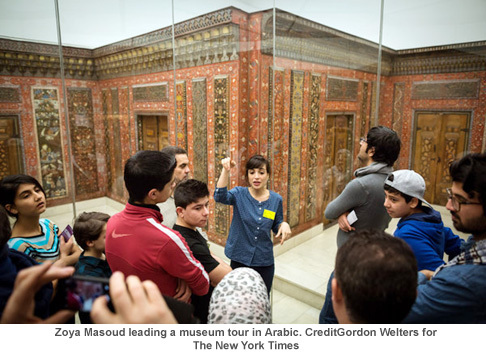 She is one of 19 guides — 18 from Syria and one from Iraq — who are part of a program, called Multaka, or “meeting point” in Arabic, which began in December and is aimed at training refugees to become museum guides. The program is largely financed by the German government, including the Culture Ministry, which answers directly to the office of the chancellor, Angela Merkel. It also draws on some private foundation funding. It offers two Arabic-language tours a week at each of four Berlin museums: The Islamic Art Museum and theMuseum of the Ancient Near East (which are both inside the Pergamon); the German Historical Museum; and the Bode Museum, including its collection of Byzantine art. Educators from the museums are training the guides, many of whom had good jobs and social standing in Syria. “The nice thing is to give them something that gives them a purpose,” said Stefan Weber, the director of the Islamic Art Museum. The program also serves to “open up new public spaces for them” and to help “many other newcomers find a way to the museums,” he added. Multaka is one of a host of new public and private programs taking shape since last summer, when Germany began taking in the first of more than one million asylum seekers. The government has also been providing food and housing and offering language and training classes. Multaka seems representative of the spirit in which Berlin, Germany’s cultural hub, has embraced the new migrants even as skeptics worry that they are straining the social welfare system. The museums have not kept track of how many visitors have come on the Arabic tours, but each week more people learn about them through word of mouth and social media. Guides are encouraged to point out the objects they find most interesting, and also to share their own experiences, “to have an open discussion,” Mr. Weber said. The Islamic Art Museum — which in recent years has also been involved in helping to track artifacts under threat in Syria — was founded in 1904, among the first of its kind. Most objects came from lands then under Ottoman control in an era when Western collectors bought (some critics say plundered) artifacts. The first fragments of the Ishtar Gate came to Berlin in 1903 after negotiations between Germany and the Ottoman Empire. 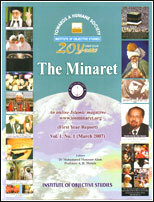 Over the years, Iraq has called for the work’s return. On a recent afternoon, Ms. Masoud’s group included a dozen young teenagers from Neuköln, a Berlin neighborhood known as a melting pot, who arrived with the teachers of their intensive German-language course. They raced through the galleries and peppered their guide with questions. Helin Hasan, 14, the only girl in his language class, said her favorite part was seeing the high carved walls of the desert palace of Mshatta, built in the eighth century south of Amman, Jordan, for an Umayyad-era caliph. “It was the most beautiful,” she said of the walls, whose ornate carvings reveal the intermingling of Eastern, Western and Byzantine motifs. Ms. Hasan wore a T-shirt and did not cover her head, like some of the other women on the tour. Mr. Alramadhani, the Iraqi economics student entranced by the Ishtar Gate, was visiting with a German-language class of older students. His journey had taken him from Turkey to Greece by boat, then through Macedonia to Germany. Asked what was harder, economics or German grammar, he laughed. “Surely the German language,” he said. Twenty years ago, Ms. Gretscher-Saïd taught children who had just arrived in Germany from the Balkans and the former Soviet Union. Today, they are from Syria and Iraq. It pains her to think of her students’ futures in Germany, where even menial jobs require training certificates. “Here you have to have papers, papers, papers, papers,” she said. Many German employers would prefer to hire someone named Oliver over “someone called Ahmed,” she added.